Gnocchi can serve as a main dish or side dish, you can even sneak in a little Italian sausage or ground beef if you like. Heat the protein in the skillet with the sauce for the gnocchi. 1. Scrub the potatoes and place in a 6-quart pot of cold water. Bring to a boil and add a generous amount of salt. Boil until tender, about 30 minutes. 3. In a bowl, combine the eggs, salt, ricotta, and self rising flour. Mix well, then add half of the all purpose flour. 4. On a lightly floured surface, make a mound with the riced potatoes, then make a well in the center of the mound.. Add the eggs mixture to the middle of the well. Slowly combine with the potatoes, to make a dough. Knead the dough with the palms of your hands. Add the remaining flour a little at a time, only as needed. The dough should be smooth but not sticky. 5. Cut the dough into six equal pieces. On a floured surface, use your palms to roll each piece into a long tube. You may need to cut each of those pieces in half as you roll it. Use a bench scraper to cut each roll into 1-inch-long pieces. 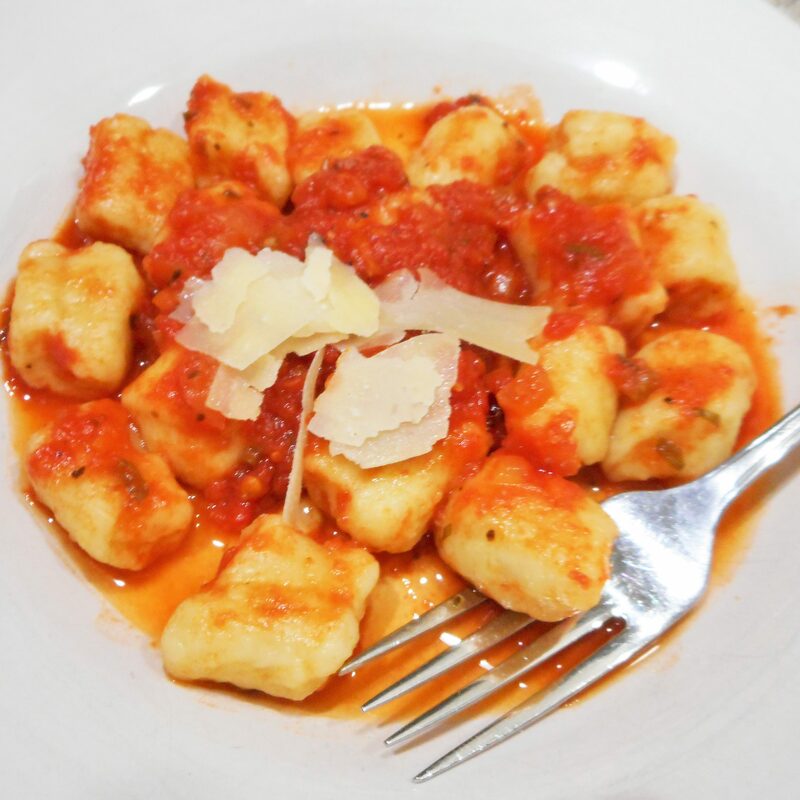 Roll each piece down the tines of a fork to give it the classic gnocchi shape. 6. Meanwhile, In a large wide skillet, warm the marinara sauce. Cover to keep the sauce hot, but not boiling. 7. Bring a 6-quart pot of salted water to a gentle boil. Cook the gnocchi a few at a time for 4 to 5 minutes. Once the gnocchi come to the surface of the water, let them cook 1 more minute and then remove with a slotted spoon to the waiting marinara. 8. If desired, dust with freshly shaved Parmesan cheese and fresh basil before serving.